Keto-Mojo Help Docs & FAQs - Why do my ketone readings vary from the same drop or two drops within a short time period? 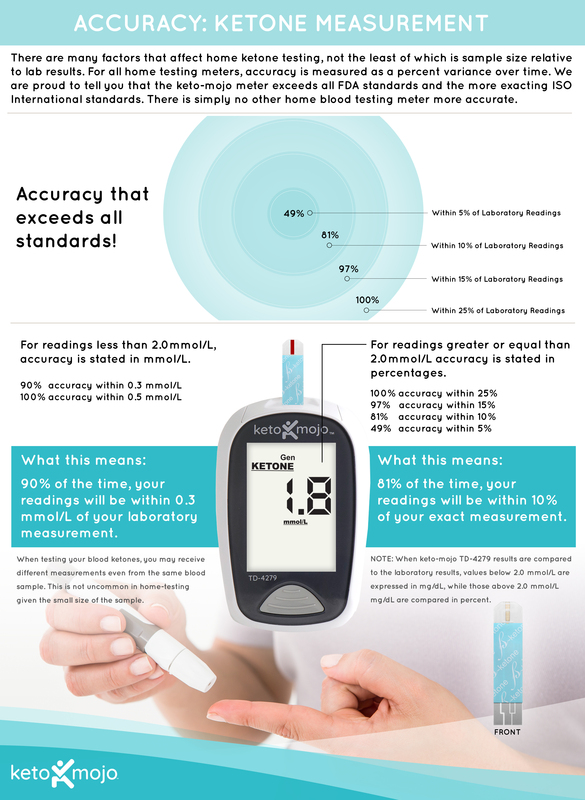 All Categories ​>​ Using Your Meter/ User Manuals ​>​ Why do my ketone readings vary from the same drop or two drops within a short time period? Why do my ketone readings vary from the same drop or two drops within a short time period? There are many factors that affect home keto testing, not the least of which is sample size relative to lab results. For all home testing meters, accuracy is measured as a percent variance over time. We are proud to tell you that the Keto-Mojo meter exceeds all FDA standards and the more exacting ISO international standards. These is simply no other home blood-testing meter more accurate.